There have been loads of classified-ads website that caters the “buy-and-sell” service online, but an interesting app will certainly spice up your transactions once it’ll be available in the App Store. ProductGram is an interesting way to sell your stuff with a profound exposure to top social networks like Facebook and Twitter. 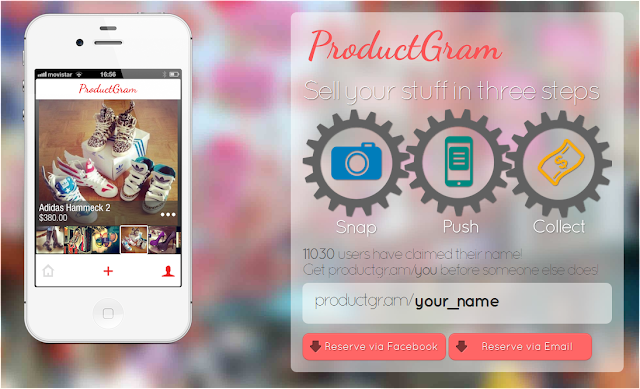 The ProductGram will also be a platform for online users wherein they could interact with one another about the products that will be posted on the app. It’s like an infusion of the best shopping experience and enjoyable social networking. As their website suggests, the app will allow you to sell your stuff in three steps. The Snap button will obviously allow you to take a photo of the stuff that you want to sell. The Push button will upload your pictures in the app, they might offer great filters to make the experience more fun. And the Collect button may obviously be the tool to manage your sales. The app will hit the App Store soon and the developers are offering you to reserve your desired usernames for free before someone else does. Currently there are over 11,000 reserved users. Follow the link below to get your own username in this amazing app.